In the government’s sale disposition of BC Rail, there are compelling indicators of massive fraud. Even worse, senior provincial officials interfered with investigation and prosecution of these crimes. Having directed the asset disposal and wanting to avoid revelation of duplicity, Premier Campbell’s office chose to pervert the administration of justice. Important public agencies and individuals cooperated or at least provided passive acceptance of fraud. Political analyst Will McMartin has written about a “tight coterie of business people who have been favoured with high-powered political appointments since 2001.” Some of these people have been near the centre of the BCR cover-up. This is not Alex Tsakumis’ first important revelation. His blog entries are like flowing water, steadily scouring the supports that keep BC Liberals alive. The BC Rail fiasco may ultimately ruin careers and reputations of politicians, lobbyists, police investigators, business executives, journalists, lawyers and at least one judge. Many people know large parts of the truth of BC Rail. Silence has been purchased with contracts and directorships but the provincial government’s ability to sustain financial favours is waning. Bitterness over greed of a relatively small number of Liberal insiders ensures the party’s destruction. Recent polling indicates the trend is firmly established; the governing party will disappear. Conservatives, with no members in the legislature, now have almost 2/3 of the voter support held by the Liberal Party, represented by 48 sitting MLA’s. In addition, the NDP front bench under Adrian Dix seems by comparison, competent, knowledgeable and trustworthy, ready to form government. The Internet presents an opportunity for individual journalists. You don’t need to work at the Vancouver Sun anymore to be a significant journalist in Vancouver. Professional journalists have lost their status as the only gatekeepers. And now, even writers who have been minding the gates for the Liberal Party are slipping away, admitting, as both Keith Baldrey and Vaughn Palmer have done in print recently, that Liberal governance has been far less than perfect during its entire tenure. BC Rail is the cancer that affects this province, because it become the focal point of the BC Liberal mantra of enriching political friends and cronies by selling off BC assets at fire sale prices. We live in a newer, kinder Fascist state, brought to you by the mainstream media, who have sold their souls to the almighty advertising dollar. Want positive reporting about your project/political party, then advertise with us. Those “hacks” that have taken George Orwell to heart have rewritten political history in BC (he who controls history, controls the future); BC Rail, Fast ferries, Gateway; Canada Line, etc. are all either ignored or supported by the MSN as per the need of their puppet masters in Victoria. If future historians are allowed to, they will call the BC Liberal era in BC as some of the darkest days in BC history. I share your view of the Liberals and the media (and can't disagree with your view on the BC Cons), but I don't agree with your statement that the NDP front bench are competent, trustworthy or ready to form government. No doubt there are some very competent NDP MLAs (Shane Simpson, John Horgan, Nicholas Simons, Claire Trevana, Bruce Ralston come to mind). In general though the BC NDP are too tied to unions, in the same way that the Liberals are too tied to corporate pals. The unions hanker after power just as the corporations hanker after power. The problem with the NDP is that they have done little or nothing on key portfolios — BC Rail being the most obvious one. Leonard Krog would be BC's next Attorney General if the NDP get in. Krog has done less than nothing on many files, preferring to sit on his hands. But there are other areas where the NDP has been curiously flat, health care for one. Union interests aren’t necessarily the same as the people’s interests. For example, the Ombudsperson's report on Seniors Health Care in BC has been Missing in Action for going on four years now, yet the NDP critic for that portfolio has done nothing about the Ombudsman's curious deflection of this critical issue. Such inaction, despite years of stories about elderly people in nursing homes being horribly abused, and health authorities behaving in autocratic, bullying ways, is startling. All the NDP have done about this serious issue that is ballooning out of control is to weakly echo what the government is going to do anyway, namely put some sort of seniors advocate in place. Why no castigation of the Ombudsman’s virtual disappearance on the matter of her Inquiry?? Meantime, story after story of seniors who are harmed and drugged in BC's residential care system are left on the sidelines with no one advocating on their behalf. Minister de Jong announced almost a year ago now that the government was going to conduct a Review of the use of Antipsychotic Drugs in Long Term Care but neither the government nor the NDP have said anything about that since then. What’s going on? Why wouldn’t the NDP jump on this? Could it be that the NDP's close ties to health care unions might be the reason? I wish I could trust the NDP, but it makes me very nervous that they aren't taking the bridle in their mouths more vigorously when the opportunities for them to do so are so great, and so needed. Anonymous, you make some good points but I see very little power exercised by unions in this province. Public sector workers have been convenient candidates for whipping posts but that is largely false media reporting. North America's middle class was never stronger than when unions were influential. Yes, there were some abuses but putting money in the hands of working people put money directly into communities. Putting large stacks of money into the hands of Patrick Kinsella, Brian Kenning, David Hahn, Alan Seckel, Martyn Brown, Ron Norman, Paul Taylor, Elizabeth Harrison, Donald Hayes or countless other Liberal insiders sold a few premium German cars and furnished a few mansions but did little for local businesses. Dix, Horgan, Farnworth and other NDP leaders are walking a fine line. Frankly, their quiet strategy is necessary to overcome the media's desire to paint them as dangerous radicals. They are applying pressure effectively and the government is imploding. The public attention is where it should be, on the Liberals. Dix has brought added focus to the opposition and the critics are being encouraged to know their files well and gather indisputable evidence of incompetence and wrong doing. They only have about ten sitting weeks a year and not every program and policy gets its due exposure. This government sets up roadblocks to transparency that would amaze ordinary citizens. It amazes and frustrates opposition MLA's. Your list of bloggers is impressive however there is another name missing. And that Norman Farrell who does an outstanding job every day. This is a very necessary and cogent article. What's changing, we hope, is the baby-bottle dependency of all of us on single news sources. It saddens me, but I used to feel I could depend on the CBC…Given the gaping holes in their TV coverage lately (nothing on Boss Power, for example), I can no longer trust the MSM. This began with BC Rail. The refusal of the MSM to ASK THE QUESTIONS raised in the blogosphere was a serious dereliction of duty to the public trust. We didn't need them to spread gossip or rumors, but we did need them to insist on the right to ask relevant questions, directly to the Minister level, particularly after the court case was scrapped. They refused to do it, for fear of what?…they won't say. And I say that having corresponded with some of the reporters who covered it…All agree the plea deal stank, but it's the blog writers keeping it alive. I tend to agree with A @ 7:44, at least to a point.From Carol James on, you are right, the NDP has been too quiet about the issues, we should have heard a lot more from them on BC Rail and the HST. I would still vote for them though. I feel that the Conservatives are an unknown quantity right now, and prefer to wait and see how many displaced Lieberals they take in after the election. That is what scares me. I fear that too many of the present clowns will try to move over to the Conservatives in an attempt to regain power, and we know how well that has worked for them in the past.Like a leopard, crooked politions never change their spots, just the flag they work under. Then we have, P.M. Harper rewarding the worst most corrupt politician, Gordon Campbell as High Commissioner to England. So the decay starts at the very top. Neither Harper nor Campbell, have any morals nor ethics. Harper had another criminal working for him. A many times convicted American felon for him. Dictators always surround themselves with the degenerates. The media is always muzzled as well. In England liars and thieves, on the political scene are punished. Lord Taylor and Lord Hanningfield, were sent to prison. Harper rewards corrupt and evil politicians, for doing his dirty work for him. Any use of anti-psychotic drugs in long term care can refused by the patient or family. It cannot be forced upon a resident of LTC by anyone including their doctor. My father refused his meds when he was a resident and there was nothing staff could do about it, and he was a dementia patient. What other kind of advocating would you want? Just say no. Anonymous@7:44am I can’t agree that Leonard Krog has done nothing on the BC Rail file. In fact he has been pressing the case for years and has been relentless in his pursuit using the legislature, any media outlet that will have him, the courts, public agents like the Auditor General, FOI Commissioner, election campaigns, and interactive public discourse. To quote the Vancouver Sun, “His 100 questions on BC Rail, posted on the order paper for the legislature several years running, stand as mute testimony to the government's unwillingness to answer even one of them to date.” One could ask why the Vancouver Sun doesn’t post at least one of the questions each day on its front page until answers asked in our legislature are provided, but that isn’t Mr. Krog’s fault. Don’t take my word for it; try a Google search to see where he’s been on this if your memory is a bit hazy, and then come back and tell us what you suggest Mr. Krog should do that he hasn’t been doing. I’m sure he would take any constructive ideas you have. There are a lot of people to blame for lack of answers on the BC Rail debacle. Mr. Krog isn’t one of them. I am Anon 7:44. I supported the health care unions (e.g. HEU) with action, letters and political activism when Campbell illegally tore up their contract shortly after taking power. Yes, unions are often used a whipping boys by the right, just as corporations are by the left. But, there’s no denying union power, especially in health care, as demonstrated in the power staff exercise over the lives of others, and in the power they have been given by this government and their unions to act without fear of sanctions in exercising that power. I’m an elder advocate, and work with some very good and caring nurses, doctors and care aides. However, they themselves say they work in a very hostile professional environment and have to be careful not to get on the wrong side of the system. BC’s residential care system is not just any program, it’s an enormous and growing part of our expenditures, and significant, even criminal, abuses of vulnerable human beings are taking place within that system. It’s no excuse to say that MLAs only sit about 10 weeks per year so can’t address everything. The MLAs on both sides of the Legislature are paid to work on our behalf all the time, not just while the Leg is sitting. Given the horror stories coming out of the residential care system, the matter is of utmost importance. Here are some of the horror stories I’m aware of. The Interior Health Authority sought and was granted in January 2010 a BC Supreme Court order to ban, forever, a video taken by a nanny cam hidden by family members. That video showed an assault of their elderly father by Kamloops care facility staff. The man died a short while later. No charges were ever laid. The IHO even brought a defamation claim against the family! The matter was “settled” by the BC Supreme Court order banning the video. The Interior Health Authority stated in a newspaper article that they had sought that court order to “protect staff privacy”. In early 2011 an elderly man died in a Lower Mainland nursing home and medical staff were discovered having lied claiming that his death was “natural”. The daughter of Eldon Mooney had hidden a video camera in this man's nursing home room, and captured his death while choking on his food in the presence of a nursing home staff member. The daughter is quoted as saying the coroner wouldn’t have paid any attention to her father’s death without the video evidence. I recall you even reported on one such story earlier this year, that of an elderly Victoria woman, Kathleen Palmerck (spelling may be wrong), who was apprehended by and mistreated in a nursing home run by a non-profit outfit funded by our tax dollars. There was a video released there too. Taken just days before her death, the video shows that woman was hale and hearty for her eighty-plus years, even as the nursing home and authorities were vigorously portraying her as a near-vegetable. At the time of the woman’s death, this nursing home had been reported to police for the narcotic poisoning of this same woman a few months earlier. Astoundingly, no action has been taken against the nursing home by anyone, including the NDP, to get to the bottom of this case, even though a local Victoria magazine called Focus printed an in-depth article. So, I don't agree with your statement that the NDP are “amazed and frustrated”; I believe that, on this serious matter, the NDP are for the most part simply sitting on their hands, silent. The Liberals may have been speaking in support of nursing home operators, and the NDP in support of union members, BUT who is speaking for elderly people who are suffering abuse in BC’s residential care system and their families??? I'm with you Norm, re: the evil influence of unions and the false equivalency of their NDP ties to the BC liaRs ties to croporate pigs. You are also correct as to why this false idea survives, due to the incessant repetition of that “Big Lie” ala George Orwell by the Lamestream Media. The unions' interests in family supporting wages and safe working conditions are more in tune with the average working British Colombian, than is the greed and exploitative behaviour of the likes of “Patrick Kinsella, Brian Kenning, David Hahn, Alan Seckel, Martyn Brown, Ron Norman, Paul Taylor, Elizabeth Harrison, Donald Hayes or countless other Liberal insiders” even if the greedpigs control over the media has kept far too many average BCers fooled into voting against their own interests, just as the astro-turf Koch bothers funded TeaBaggers and ReThuglican Party has managed to achieve in the failing nation to our south. Hi Norm. Somewhat off-topic, but since you mentioned him in this post, do you happen to know what Will McMartin has been up to lately? He hasn't posted anything at The Tyee since April, and I haven't been able to find anything by him anywhere else since then. No, I do not know what Will McMartin is working at now. His contributions to political reporting is missed. Perhaps another reader can provide an answer. Norm, that Tom Tommorow cartoon is right on. It is so obvious that we are being treated to the same old Irag/WMD BS with Iran as the target this time. Sometimes I actually almost hope either the Zionists or they in tandem with the Yanks pull the trigger on Iran. Then first, Israel will cease to run the US House and Senate, because it will turn into a glazed parking lot too radio-active to use for millenia, especially if them nasty Iranians (who by the way have not invaded anyone for centuries, but were recently invaded by Saddam with US urging and support – with Saddam using US supplied chemical/gas weapons – Saddam never had a WMD he didn't get from Uncle Sam and I still think Valerie Plame was cut off at the knees for foiling Dickhead Cheney's attempt to smuggle nukes into Iraq to cover their own lying asses) actually DO have nuclear weapons – they don't need much of a delivery system to reach Tel Aviv. Even if an attack on Iran doesn't depopulate the entire Middle East, thus eliminating all the problems there, it may at least lead to a big enough REAL war that will lead to a relatively more realistic attitude towards war such as we enjoyed after WWII, the big one, as Dobie Gillis' dad used to say……..
All these assholes like Spiteful Steve, Cameron, Bu$h, Cheney and even the Big O should realize that if military attacks continue to be the answer to everything, eventually some of the other REALLY big guys will enter the fray (the Russian bear or the Chinese or both). Then we'll get it out of our system for awhile at least. BTW, I like my chances of survival better than someone in say Vancouver, Tel-Aviv and many other places – besides I only have so many years left already, so a bomb on my head, if someone tries to take out the dams on the Columbia won't shorten my life all that much and maybe my children and grandchildren, who also live mostly in places less likely to be in the thick of it could live in peace for some of their life! Sorry for the slightly risque language involving bodily orifices, but I already toned down how I really feel. 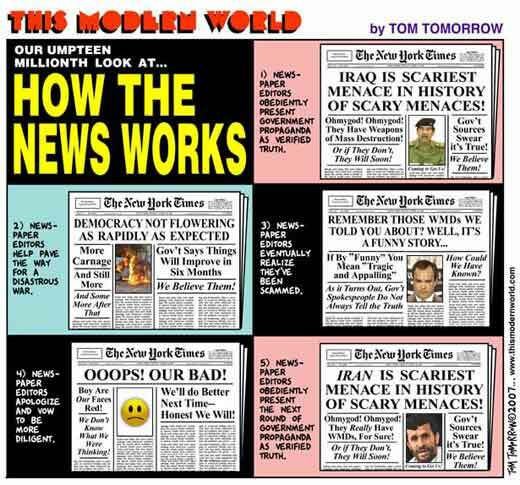 I realized the Tom Tomorrow piece touches a specific issue that I hadn't intended to open but I used it because it demonstrates common dishonesty of media. The real story is known to many but they report the official version or the version that comforts the ruling establishment. The BC Rail scandal is an example, the Liberals have been steadily lying about this matter, yet Postmedia reports every new claim with complete lack of skepticism. Read Vaughn Palmer's fluff from Oct 29, titled Falcon's eagle eye focused on the bottom line. Palmer has a man-crush on for the Liberal Finance Minister who he recently called “action man.” So, all the lies of past years are forgotten, along with the massive deficits and giveaways. Palmer writes like a reporter who just arrived. Coincidence or design?